The first thing you notice when you walk into La Carbonera is the delicious smell. Then take in the decoration – mirrors and lighting have been thoughtfully placed to create a welcoming and intimate feel. 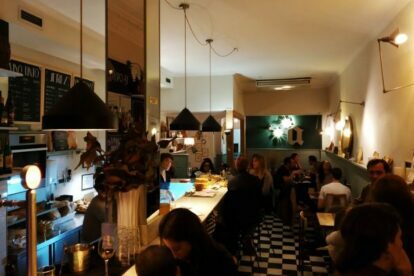 Madrid has a few cheese bars, but La Carbonera offers an extra special experience to diners. Their well-curated menu features cow, goat and sheep milk cheeses; 6 of each. You can choose the size of your selection, and how many cheeses you want to sample. The presentation is gorgeous – nuts, dried fruit and fresh figs decorated the platter. Cheese not your thing? Don’t worry, they also have a menu of hot and cold dishes, including a delicious homemade Russian salad, ceviche, vegetable wontons and beef ribs. And leave room for dessert – also homemade and excellent. The wine list is interesting too – predominantly Spanish as you would expect, but with a few wild cards thrown in with the typical Riojas and Ribera de Dueros. Take a chance with a wine from Menorca, Tenerife, Salamanca or even Morocco! And really, what is better than cheese and wine? Why, cheeses and wines of course!